A test pressing version of the BBC pirate was listed on Ebay in May 2008. It was on red or pink vinyl and had white labels. 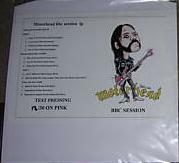 The sleeve was a white carboard sleeve with an A4 insert with a colour drawing of Lemmy and the Motorhead logo. The seller claimed 30 copies were made and that the label was Fan Club. Each copy is individually numbered. EUR 76 June 2008, Ebay, Ebay, GBP 44 (no 20) November 2008, Ebay, $78 (no 21) December, 2009, Ebay.